Terrific Topanga is the confident, smart and active girl in the “Boy Meets World” litter. 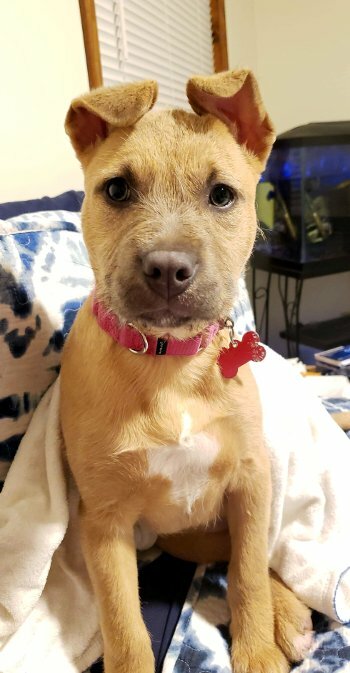 At 10 weeks old and 12lbs, this Boxer/Terrier mix has a coat which is mostly smooth and tan colored, with sweet scruffy darker whiskers around her snout and eyebrows. This pretty girl has the most expressive eyes and her adorable ears flip perfectly forward. Like her character on the show, she is bright, curious, and ready to learn. Topanga loves to climb and play, and was the first of the 3 siblings to figure out how to open the treat pouch! Topanga is looking for a loving home who will give her the structure and TLC every growing puppy needs!